PHP syntax can change between versions, but backward compatibility is generally good. Unfortunately, this has led to a problem: PHP is a mess. For example, how do you count the number of characters in a string? Is it ? ? ? ? There are hundreds of functions and they can be inconsistently named. Try writing a few lines of code without consulting the manual. Both technologies have a good range of editors, IDEs, debuggers, validators and other tools. I considered calling a draw but there’s one tool which gives Node.js an edge: npm — the Node Package Manager. npm allows you to install and manage dependencies, set configuration variables, define scripts and more. PHP’s Composer project was influenced by npm and is better in some respects. However, it’s not provided with PHP by default, has a smaller active repository and has made less of an impact within the community. npm is partially responsible for the growth of build tools such as Grunt and Gulp which have revolutionized development. PHP developers will probably want/need to install Node.js at some point. The reverse isn’t true. Where can the technologies be used and deployed? Which platforms and ecosystems are supported? Web developers often need to create applications which aren’t strictly for the web, e.g. build tools, migration tools, database conversion scripts, etc. There are ways to use PHP for desktop and command-line app development. You won’t use them. At heart, PHP is a server-side development technology. It’s good at that job but is rarely stretched beyond those boundaries. Development technologies are restricted unless they can integrate with databases and drivers. PHP is strong in this area. It’s been around for many years and its extensions system allow direct communication with a host of popular and obscure APIs. Node.js is catching up fast, but you may struggle to find mature integration components for older, less-popular technologies. How easy is deploying your shiny new app to a live web server? It’s another clear win for PHP. Contact a random selection of web hosting companies and you’ll discover the majority offer PHP support. You’ll probably get MySQL thrown in for a bargain price. PHP is considerably easier to sandbox and more risky extensions can be disabled. Node.js is a different beast and server-side apps run permanently. You’ll need a real/virtual/cloud or specialist server environment, ideally with root SSH access. That’s a step too far for some hosts, especially on shared hosting where you could bring down the whole system. Node.js hosting will become simpler, but I doubt it’ll ever match the ease of FTP’ing a few PHP files. Fewer Dependencies – All requests to a PHP application must be routed via a web server which starts the PHP interpreter which runs the code. Node.js doesn’t need so many dependencies and, while you’ll almost certainly use a server framework such as Express, it’s lightweight and forms part of your application. A Smaller, Faster Interpreter – Node.js is smaller and nimbler than the PHP interpreter. It’s less encumbered by legacy language support and Google has made a huge investment in V8 performance. Applications are Permanently On – PHP follows the typical client-server model. Every page request initiates your application; you load configuration parameters, connect to a database, fetch information and render HTML. A Node.js app runs permanently and it need only initialize once. For example, you could create a single database connection object which is reused by everyone during every request. Admittedly, there are ways to implement this type of behavior in PHP using systems such as Memcached but it’s not a standard feature of the language. An Event-driven, Non-Blocking I/O – PHP and most other server-side languages use an obvious blocking execution model. When you issue a command such as fetching information from a database, that command will complete execution before progressing to the next statement. Node.js doesn’t (normally) wait. Instead, you provide a callback function which is executed once the action is complete. 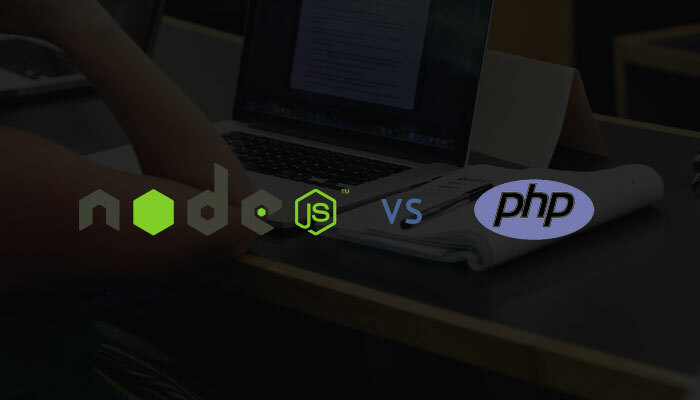 Benchmarking is subjective and flawed; you’ll find examples where Node.js beats PHP and counter examples where PHP beats Node.js. Developers are adept at proving whatever they believe! Writing asynchronous event-driven code is complex and incurs its own challenges. I can only go from experience: my Node.js applications are noticeably faster than PHP equivalents. Yours may not be but you’ll never know until you try. This may be stretching the “general web development challenge” objective but it’s important. It doesn’t matter whether a technology is good or bad if you dread writing code every day. It’s a little difficult to make comparisons but relatively few PHP developers are passionate about the language. When was the last time you read a PHP article or saw a presentation which captivated the audience? Perhaps everything has been said? Perhaps there’s less exposure? Perhaps I’m not looking in the right places? There are some nice features arriving in PHP7 but the technology has been treading water for a few years. That said, few PHP developers berate the language. It doesn’t particularly matter which server-side language you use; it will continue to work even if the project is abandoned (yay ColdFusion!) Usage has possibly plateaued but many continue to use PHP. It’s a safe bet and support looks assured for another twenty years. The ascent of Node.js has been rapid. It offers a modern development approach, uses the same syntax as client-side development and supports revolutionary HTML5 features such as web sockets and server-sent events. There has been some confusion regarding forks of the language but usage continues to grow at an exponential rate. Node.js will inevitably eat into PHP’s market share but I doubt it will overtake. Both technologies have a bright future. I declare this round a draw. The final score: five rounds to Node.js, four to PHP and one draw. The result was closer than I expected and could have gone either way. But don’t discount it. PHP is alive and there’s little reason to jump on the Node.js bandwagon because it looks faster, newer or trendier. PHP is easier to learn yet supports proficient professional programming techniques. Assistance is everywhere and deployment is simple. Even die-hard Node.js developers should consider PHP for simpler websites and apps.